I can't believe we're already back from China. This trip came and went so quickly! It was such an amazing vacation and experience, and I'm so excited to share it with you. After one of the longest days of our lives (15+ hours in the air plus 8+ hours in airports), we arrived in Shanghai on a Friday evening (we left on Thursday but lost a day by heading west). You know the term "culture shock?" China definitely has that effect, but it's incredible. The sights, the people, the colors and the food. 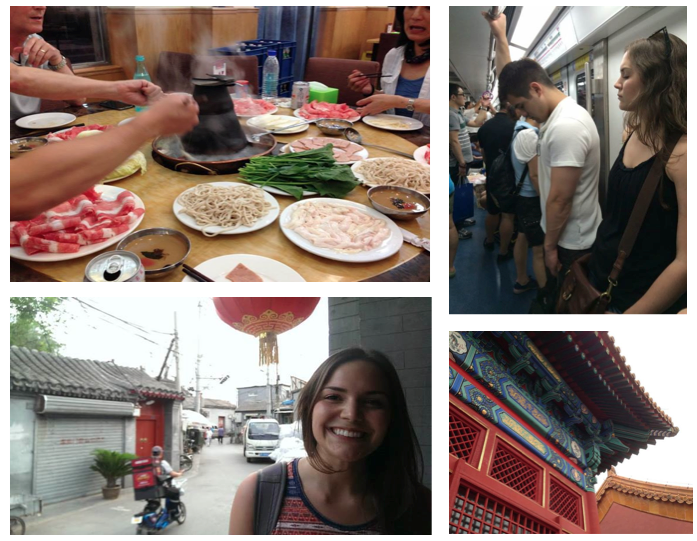 While I knew China would be an interesting journey, it's better than I could have imagined. 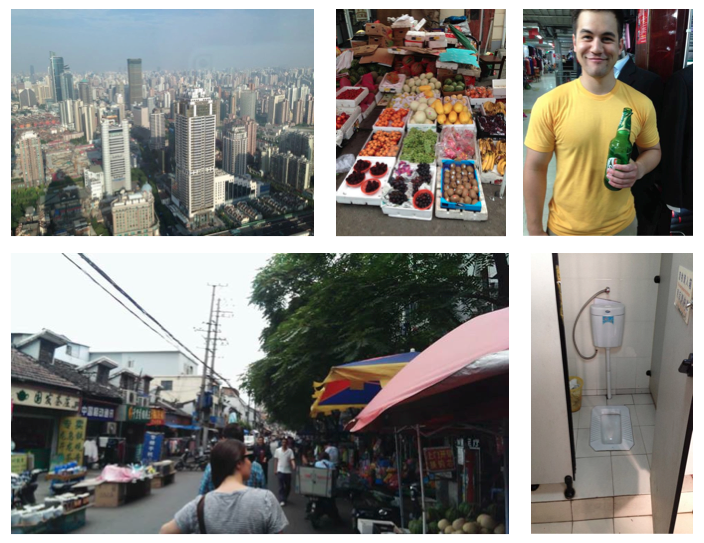 In Shanghai, we woke up to a beyond beautiful view of sprawling, smoggy Shanghai each day. We went to markets and ate fruit we'd never seen before. We drank Snow Beer at all times of the day (between 30 to 75 cents for 32 oz) in the street, in shops and on the subway, walked everywhere and became pros at mastering the "squat" toilets. We ate steamed buns filled with pork and chicken (a favorite of mine! 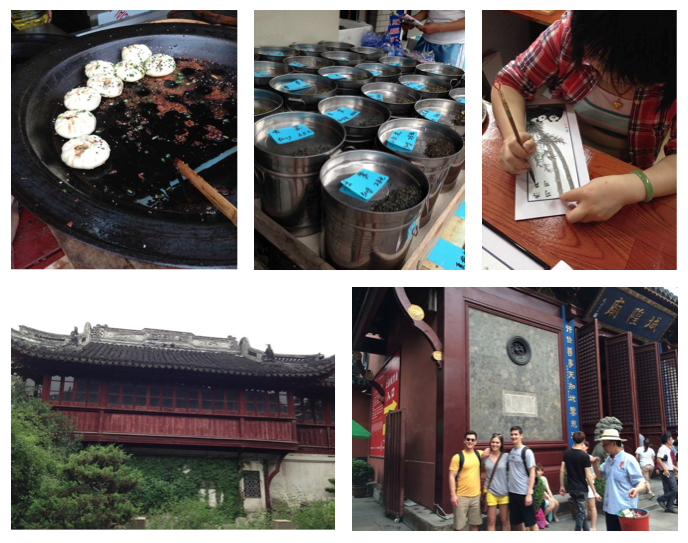 ), tasted delicious, exotic teas, visited temples upon temples and learned how to write our names in Chinese characters. And we shopped. We ate noodles in broth for breakfast, and I swore I'd never go back to eating traditional breakfast again. We stood in the presence of Buddhas. I was fit for my first qipao (and can't wait to wear it). We saw koi in ponds and koi for sale at the bird, insect and fish market. We almost took a cat or two home with us. 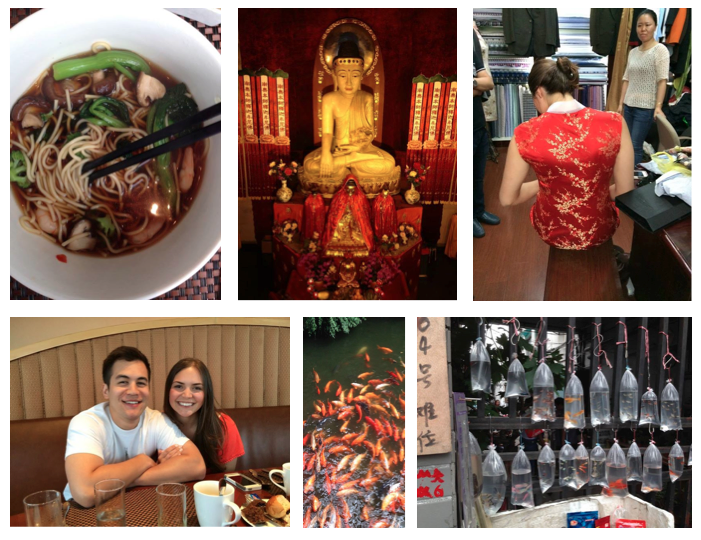 After a quick train ride to Beijing, we ventured into a quaint Beijing alley to find our hidden gem of a hotel. We enjoyed hot pot (lots and lots of it). We mastered the subway system and took a nap or two. We marveled at the history of old Beijing. 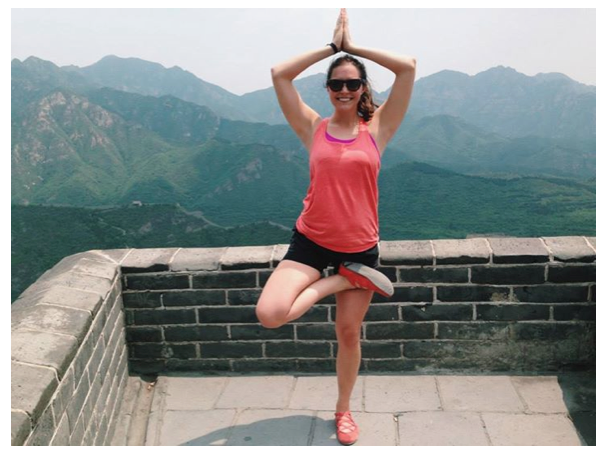 We did yoga on the Great Wall. Namaste. We climbed. We climbed a lot and rewarded ourselves to frozen Snickers bars when we reached the "top." We wiped the sweat off our faces and pushed our sunglasses back up on the bridges of our noses in the 97 degree heat (true story). We stood in awe. 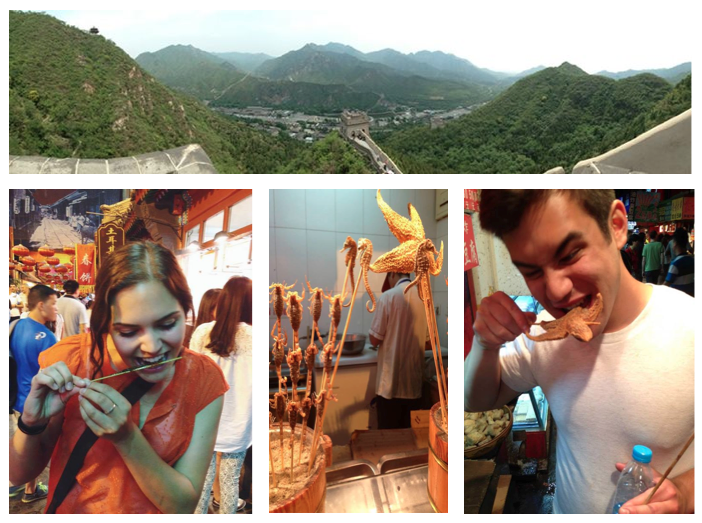 To regain our energy, we ate the exotic local delights (scorpion and starfish). Not half bad. 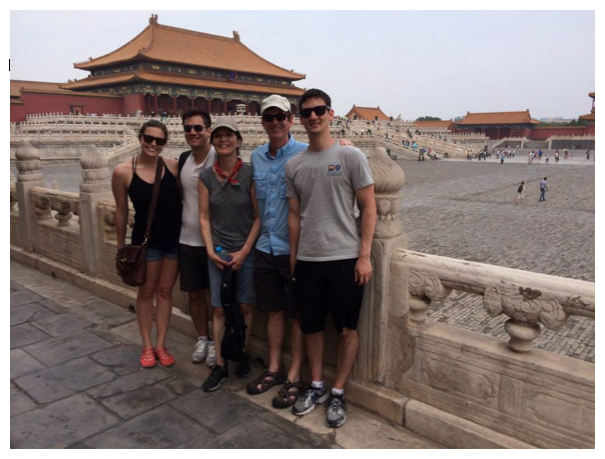 We went to Tiananmen Square and the Forbidden City, and made a new friend in our tour guide, Han, who took us to an acrobat show and helped us navigate the bus system. The best part? I spent ten incredible days with a truly wonderful bunch (group picture below!) in one of the most interesting places in the world. I'm a lucky girl.